A section of the main island of Tortola. 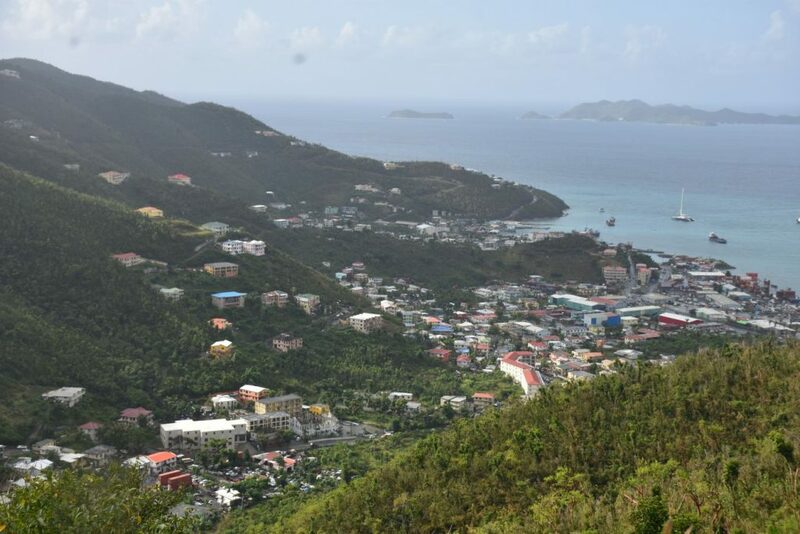 Records from the Immigration Department have indicated that the population of the British Virgin Islands has dropped by roughly 11 percent since hurricanes Irma and Maria last year. The BVI had an approximate population of 36,000 before the catastrophic disasters. While responding to questions from the Standing Finance Committee recently, Director of the Central Statistics Office, Raymond Phillips said that number has since dropped to an estimated 32,000. This figure is the clearest indication of the number of persons residing in the BVI since the aforementioned hurricanes. However, there is no up-to-date data on a breakdown of the population per island, Phillips said. He explained that his office has been relying on data from the Immigration manifest because the BVI has not conducted a population census since 2010. Some 28,054 persons were said to be residing in the territory in that year. Phillips said the BVI’s next population census will be conducted in 2020. BVI getting one wish at a time. Population dropping and now the hard times that you guys used to speak about is actually coming. Isn’t it crazy that the island you guys used to talk down on, you will now become? Immigration would only know about those under its control that have left, what about BVIslanders, Belongers and those with residency permits – how many of them have also left? But you are still reaping the sweet and mocking? I think that he has estimated about 10,000 to many. Yeah! Get rid of them all. Never could stand census takers and statisticians. Send them back to their universities and their highly respected halls of academia. We don’t need their kind here. We need people who are poorly educated; who follow politicians like sheep. Its dropped by more than that…and it will drop a whole lot further after the divorce from the UK. Look on the bright side – house prices will become more affordable for us all as prices will crash…. The UK would like nothing better than to be rid of these tiny insignificant but annoying overseas territories and especially the one with by far the worst reputation of all. The BVI. But the politicians and controlling families would lose their British Passports and the right to go to their US homes as they please. And the USA would almost certainly impose sanctions on BVI unless certain criminals were handed over and they had the right to come into our waters and lands to hunt drug runners etc. And you could kiss goodbye to the finance industry and half the tourists. So it isn’t going to happen anytime soon. BVI has been independent of UK for upwards of the last 40 years. Crippling our self endowed economy is their sly way of creating our dependency on them. Not looking to me like they want to be free of us and we of them. Economically free descendants of slaves is their worse nightmare. History does not lie. More like 30,000 before Irma and Maria and 20,000 after. Better now in many ways. You can get through town easy. Easy to get a parking spot. Banks lines easier. Much calmer. I like it! Well, we see what many of them were here for. How can they know how many people lived here before the storms? Last census was in 2010. Results have never been released. If you figure roughly 4 people per family roughly that’s about 9,000 families (based on a 36,000 estimate). One form per family and here we are about 1,600 working days later, meaning census office does not seem to be able to process fewer than 6 forms per day on average. Why bother at all? Potentially Good news. Potentially good for the horrible inflationary prices and rising crime levels….and even the increasing social ills. Just wait till the public Beneficial. Ownership registers take shape in the BVI. If you think that this is a drop in population, you ain’t seen nothing yet. Yet still it takes months to get new people through labour… no point in saying the UK might kill financial services when the immigration policy has been keeping business and opportunities for locals away for years. The BVI is well and truly screwed. It will never recover! Quantity vs quality. One of BVI regrettable move was to populate populate with any and everybody who then copulate copulate . A massive police force bigger and more schools housing criminalcourts and lawyers all,to accomadate the new in habitants and a high crime rate. Wasted money. Ridiculous. Rebuild BVI with quality. Less is more . Seek quality. Your comment is a signal of the depth of your unawareness. They never laugh with you Mr Cool Rule. You and me,we can laugh. We can sing. We can dance. The BVI will be alright in the long run. Still I challenge anyone (local or foreigh) if you do not like it here. Just leave soonest. Pure foolishness. When was the census? That numerical speculation is part of a bigger plan. @CW and BOY Blue: right on! Facts are often uncomfortable truths for many, sometimes even the masses and the educated. My health is much better there than in the U.K.